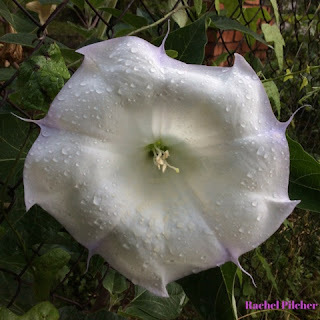 Lately, when I leave my house in the mornings to head off to work, I pass my datura bush with its previous evenings’ blooms in all their glory. They are so beautiful, I wish I could sit all morning, admiring their brilliance. Morning is the only time these lovelies can truly be appreciated since they start to unfold their trumpets just as the last of daylight slips away to the West. The bloom lasts less than 12 hours before they shrivel up, so my glances as I get into my car are about the only ones I get unless it's the weekend. This morning in particular, with the damp drops left over from an overnight rain, this bloom caught my attention and stopped me in my tracks. It glistened, glowing from within. I wanted so badly to have a seat, smell the dewy earth, and enjoy the morning. I wanted so badly to stay home and write. School will be out in just a few short weeks. I hope Ms. Datura saves some blooms back for me to see in June!